The leaders of the G-7 came together to call for maritime security, and condemned North Korea’s nuclear program. 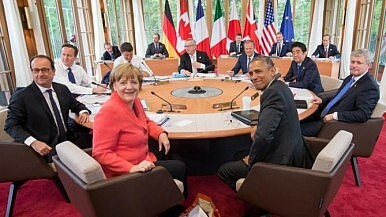 After two days of meetings in southern Germany, the leaders of the seven states in the G-7— Canada, France, Germany, Italy, Japan, the United Kingdom, and the United States—issued a joint statement, addressing a range of global issues. The statement, as it has in the past, addressed Asian security issues head-on. Japanese Prime Minister Shinzo Abe, as the only Asian leader within the grouping, which brings together like-minded industrial nations, had pledged to raise the prominence of Asian issues on the G-7 agenda. As a result, the G-7 leaders statement addresses current maritime tensions in the East and South China Seas, and concerns over North Korea’s continuing nuclear weapons program. The language is modified from last year when, in Brussels, the leaders issued a more general statement on maritime security. If Abe’s intention was to make sure that a reference to China’s activities in the South China Sea today was implicit in the statement, he succeeded. For example, last year, the leaders simply emphasized the importance of “international law and internationally recognized principles of jurisdiction in international waters.” This year, they call out UNCLOS by name, and note that they “strongly oppose” behaviors that China is either engaging in currently (“large scale land reclamation”) or has engaged in previously (“use of intimidation,” as seen in the oil rig incident with Vietnam last summer and the 2012 stand-off with the Philippines over Scarborough Shoal). Last year, though the June leaders statement omitted an explicit reference to UNCLOS, the G-7 foreign ministers emphasized the convention in their April 2015 declaration on maritime security. The G-7 declaration additionally condemns North Korea’s “nuclear and ballistic missile programmes,” as it has in the past. Notably, the statement’s discussion of North Korea is much shorter than it has been in the past. It notes, in a single sentence, “North Korea’s continued development of nuclear and ballistic missile programmes, as well as its appalling human rights violations, and its abductions of nationals from other countries.” Last year’s Brussels declaration included an entire paragraph on North Korea, referencing the Six-Party Talks and calls for fully implementing United Nations sanctions against the country. We support the establishment of functioning regional mechanisms of cooperation on enhanced maritime security. National and regional ownership and responsibility are key to improving maritime security in critical areas. We particularly underline the importance of regional agreements and instruments such as the Asia-Pacific Code for Unplanned Encounters at Sea, the Regional Cooperation Agreement on Combating Piracy and Armed Robbery against Ships in Asia (ReCAAP), the Code of Conduct concerning the Repression of Piracy and Armed Robbery against Ships in the Western Indian Ocean and the Gulf of Aden (“Djibouti Code of Conduct”) and the Code of Conduct concerning the Repression of Piracy, Armed Robbery against Ships and Illicit Maritime Activity in West and Central Africa (“Yaoundé Code of Conduct”). We call for the acceleration of work on a comprehensive Code of Conduct in the South China Sea and, in the interim, emphasise our support for the 2002 ASEAN Declaration on the Conduct of Parties in the South China Sea. We highlight the constructive role of practical confidence-building measures, such as the establishment of direct links of communication in cases of crisis and efforts to establish guiding principles and rules to govern activities, such as the ASEAN – China talks on a Code of Conduct on the South China Sea. We encourage States to do their utmost to implement their commitments, and we intend to assist them within the scope of our abilities and regional priorities. We furthermore welcome initiatives on maritime security in relevant fora, such as the East Asia Summit, the ASEAN Regional Forum, the EU-ASEAN cooperation, and regionally based Coast Guard Forums.